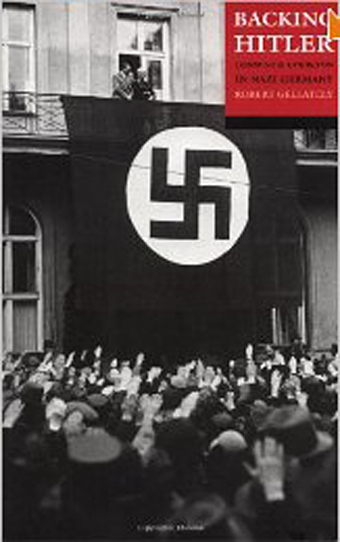 In his introduction, Gellately sets the premise that Hitler was well received in 1933 by most Germans who applauded his goals of “restoring the grandeur of the Reich” and “cleaning out undesirable aliens.” He argues that this widespread support for Hitler did not waver substantially until more than a decade later when it was obvious that the war Hitler had sought was clearly lost. He states that the Nazi regime, while selectively brutal with its chosen enemies, did not create a universal terror for most Germans, and that most Germans supported brutality against people for whom they had little sympathy. He further asserts that a vast array of material regarding the concentration camps was published in the media of the day, and that the German people knew very well what was going on. He does not, at least in the introduction, deal with what the German people knew about the death camps of the 1940s and the mass murder of the Jews. The most shocking quote so far is from a well-spoken middle class German woman who, looking back, says, “We had wonderful years.” The footnote sources this quote to a book by Alison Owings called Frauen: German Women Recall the Third Reich. Now we’ll see what proofs Gellately assembles regarding these premises, which have enormous potential significance to my novel-in-progress. … the Nazis won more than 80-90% of the vote, after eliminating all opposition parties. … German police were increasingly empowered to act without restraint, but those who were “good Germans” knew they had nothing to fear. … the Nazis trashed their opponents without restraint. … Germans accepted that their country would have a secret police. … Jews were systematically turned into outsiders with their legal emancipation reversed. … Jews were driven from the professions, and “it appears beyond doubt that their expulsion was popular,” at least in part because it created employment opportunities for Christian Germans. To me, there seems to be a huge disconnect between what the German people knew about Hitler’s approach and their wholehearted support of their new Fuhrer. What kind of people, understanding what Hitler and his thugs did to those they classified enemies, and how easily and without appeal it was possible to become one of those enemies, and how Hitler had totally co-opted the police, the courts, the press, and the Catholic Church, would still support such a brutal leader? I guess we must conclude (a) they didn’t care about the people Hitler was persecuting and (b) they didn’t think it would happen to them. Also, to be fair, 1933 was also almost a decade before the mechanized mass murder of the Jews at Auschwitz and elsewhere, so support of Hitler in 1933, awful as his policies were even then, does not yet mean support for the death camps of the 1940s. Gellately’s views on whether the German people also supported the Holocaust are, I expect, dealt with in subsequent chapters. It is getting harder for me to reconcile the horrors of the totalitarian state graphically described by Gellately with his contention that “a huge majority of Germans supported Hitler’s policies and thought Hitler was good for Germany.” For one thing, as the net of repressive and arbitrary police procedures grew ever tighter, how is it possible to know if the German people continued to support Hitler or were terrified not to support him? In a chapter where Nazi police are described as adopting a “preventive role, by which they meant arbitrarily arresting people who the police thought might commit a crime,” how is it possible to believe that any German citizen felt secure? How could any German be thought to support such a regime, no matter how much they publicly insisted they did? … Are those Germans who quite appropriately feared for their lives excused from culpability for the actions of a nightmarish government they outwardly professed to support? … Who had the power and moral authority to combat such a regime from within or from without? … Who could have acted but didn’t? I’ll keep reading and looking for evidence that has not yet been provided … all the while trying to figure out how I will present these questions and choices in my new novel. This entry was posted on August 12, 2012 at 7:28 am	and is filed under ** RESEARCH for A FLOOD OF EVIL. Tagged: "Backing Hitler" by Robert Gellately, holocaust, Jewish historical fiction, Nazi Germany, research for Choosing Hitler, why Hitler. You can follow any responses to this entry through the RSS 2.0 feed. You can skip to the end and leave a response. Pinging is currently not allowed. Excellent…I love the synopsis because I don’t have time to read all these books which interest me so much. Thanks….